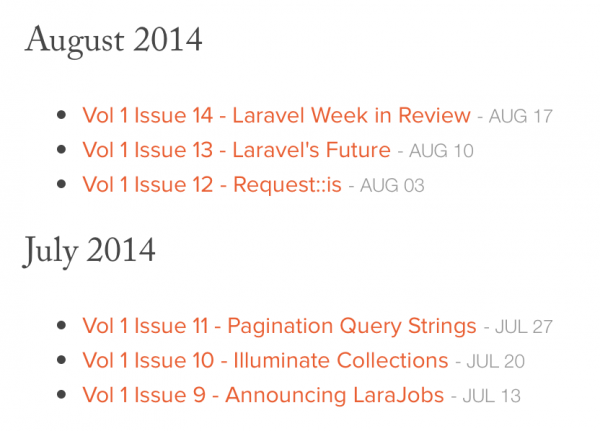 On my Laravel News site I send out a weekly digest newsletter and I decided very early that I didn’t want some automated system of just grabbing all this weeks posts and sending those. However, I did want to automate as much as I could and in this tutorial I want to share how I setup WordPress to handle the creation of each weeks mailing. If you notice the only thing out of the ordinary is the “supports” line. I prefer to write in markdown and that integrates markdown from JetPack. Now that I have a custom post type its time to integrate it into the site. Since I named my post type “digest” I needed to create two new template files: “archive-digest” for the listing and “single-digest” for the individual mailing. The one thing to note here is how I’m including css inline. By utilizing php’s include() function I import the entire contents of newsletter.css right into the output. That will be used later by the css inliner service. The body portion is again the typical WordPress post loop. At this point I created a test digest post and it is indeed showing correctly. So now it’s time to move on to how to control the content blocks. My digest template as you can see from the first screen shot is a single column with three or four sections broken up by a line. Each one is its own table and via css I apply a border-top to the content sections table. Primarily each section is custom written except for a listing of the weeks posts. So I thought I need a simple way to accomplish this without having to write tables in the admin. Tables are gross and I want to avoid that all costs. The question is, what should [[break]] do? I want each block in a table so it needs to wrap it but I can’t grab all the content between the breaks as that would be messy. Instead I decided that a [[break]] would just close the table and open a new one. This will work as long as you don’t end the content with [[break]]. Seeing how this is not something for the masses I’m good with that. So with this set, [[break]] in my post calls the “laravelnews_break” function which in turns calls table_end and table_start. It just reuses the start and end table functions that we built in inc/digest and keeps it clean. The magic here is the custom WP_Query. I pass in the year and week of the current post. Since I write these once a week it will always need the posts from the week the newsletter is published. Now that we have a basic layout with all the pieces in place I want to allow readers of this page to subscribe to the newsletter, but only show it if they are reading via the web not in what is sent in the email. I put the newsletter form inside this if and now it only shows to those not logged in. Which in my case is everyone but myself. After everything above is completed now its time to do the manual processing. I’m using sendy.co (shameless affiliate link) to handle the emailing and it does have its own web preview. I prefer to have it on the blog and integrate my own features such as a signup form, analytics, etc. I write the newsletter copy inside WordPress admin and hit preview until I’m satisfied. Next view source on the preview, and paste it into an inliner, finally take that and paste it into a new campaign in Sendy, schedule it, and head off to play golf or something. As with anything in the crazy world of web development this is just one solution to a problem. I’m sure you could use any of the plethora of mail services and I would recommend that in most cases. I enjoy thinking of obscure solutions like this and I like learning new tools. Building things like this is fun and by sharing this tutorial I hope you can at least pick up a few tips and tricks. I also have a complimentary repo with all the code used in this tutorial.